The just concluded elections in Ghana, which have won international plaudits for being free and fair, shows that former military ruler and later civilian president, Rawlings, has bequeathed to his country a stable and vibrant democracy. His 1981 coup was really the revolution to end all revolutions in Ghana. Now Ghana has matured into one of the great African democracies. The credit for this proud achievement goes first and foremost to Rawlings who voluntarily relinquished power in 2000 after 18 years at the helm, and who laid the foundation stone of Ghana's Fifth Republic in 1992 when he presided over the return of multi-party democracy. Rawlings' metamorphosis is indeed incredible! When he first came to power in a coup in 1979, he struck fear into the hearts of many of his countrymen when he publicly executed three former presidents and senior government officials without a fair trial for alleged corruption. Yet within three months, Rawlings and his AFRC handed over power to civilians. Twenty seven months later, in 1981, Rawlings seized power again and famously declared that that was the last coup in Ghana. He led Ghana out of a near famine situation in 1982/84 into a prosperous period from the early 1990s when Ghana became a role model for its successful implementation of Structural Adjustment Programmes. 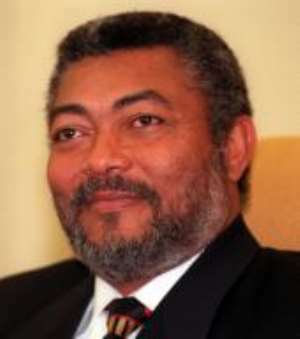 When the pressure for the restoration of democracy mounted, Rawlings accepted the popular yearning for multi-party rule and organised and won two elections in 1992 and 1996. In 2000, he joined the shortlist of African leaders who have willingly handed over power. Of course, there were other agents of change including the highly critical Accra press and civil society such as the Bar Association and the students, some of whom, including the crusading editor, John Kugblenu, lost their lives in the fight for democracy and the rule of law in Ghana. Now Ghanaians are harvesting the sweet fruits of the sometimes very bitter days of Rawlings' military rule. The international acclaim for Tuesday's elections have won much respect for Ghana, and it has put the country on the enviable pedestal of democracy achievers in Africa. Now the international community should assist in the further strengthening of governance by helping the country to fight poverty and diseases.